Ever since I stopped eating so much bread, breakfast has been an issue. Long gone are the days of cold cereal or toast with jelly. (Oh how I miss toast with jelly.) I usually start my day off with some vanilla yogurt and granola. It’s light, delicious and quick. But sometimes I want something salty, and with a little more substance to it. Something that will stick with me, the kids and my husband until lunch. Something we can pull out of the refrigerator, warm up and eat within 30 seconds. 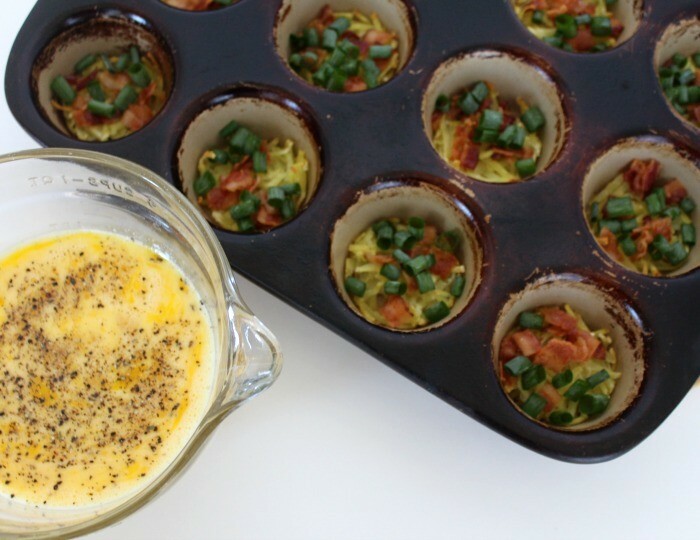 That’s why these Hash Brown, Bacon and Egg Breakfast Muffins are perfect. I’m sure you’ve seen these popping up all over the place, whether it’s your Pinterest feed or Facebook. I’ve seen about as many variations as shoe choices I have in my closet. One of my family’s favorite meals I prepare about once a week is some type of frittata. Lately our favorite has been a loaded baked potato frittata. It.is.delicious. I decided to adapt it slightly and see if using somewhat of the same ingredients would work. Guess what? It did and they are yummy! When I make the frittata, I use chopped up, cooked potatoes. Usually they’re left over from bake potato night, which makes it super easy. Or I fry them up in the same skillet I’m cooking the frittata in. Both ways help put dinner on the table pretty fast. 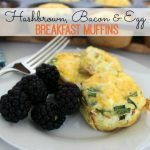 But for these breakfast muffins, I decided to try hash browns instead. 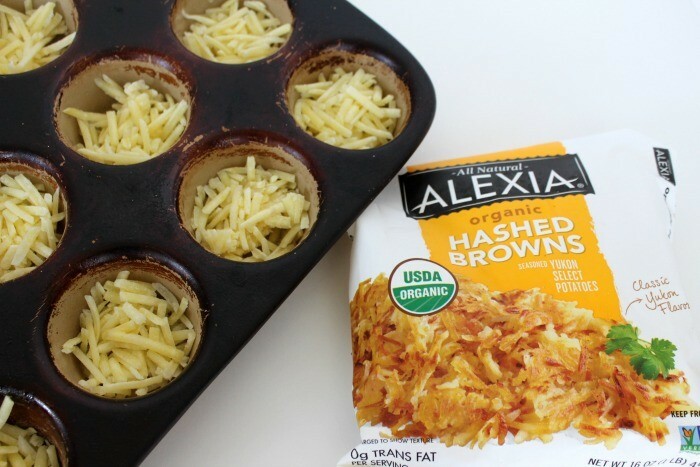 I went with the Alexia hash browns. (Or hashed browns as their bag says. Have I been saying it wrong all these years or something?!) This is not sponsored by Alexia. I just prefer their hash browns for this recipe because they contain less water than other brands. That’s what I’ve noticed anyway. The last thing I want to have to mess with before baking these is squeezing water out of them. Anyway, all you need to do is spray generously the bottom and sides of a muffin pan. I prefer my stone one, which as you can see has been well loved over the years. Put a little bit of hash browns on the bottom and spray lightly with vegetable spray or you could brush them lightly with vegetable oil. This helps them crisp up better. 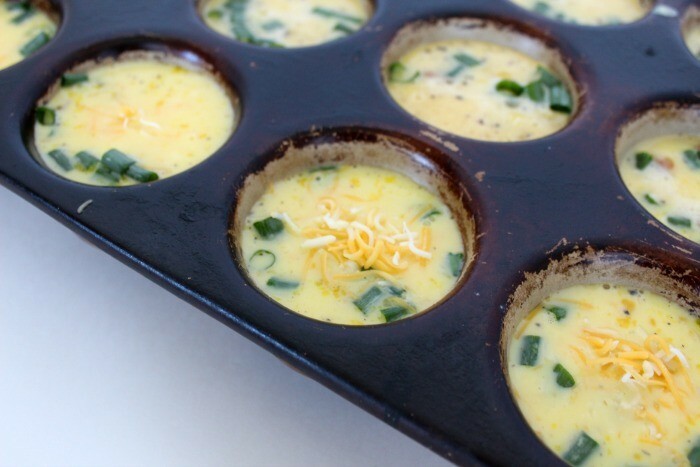 I’ve also heard you can stir them in a little bit of olive oil and then put them in the bottom of the muffin tin. But I haven’t tried that. Bake them in a 400 degree oven for 20 minutes, until a little golden brown. 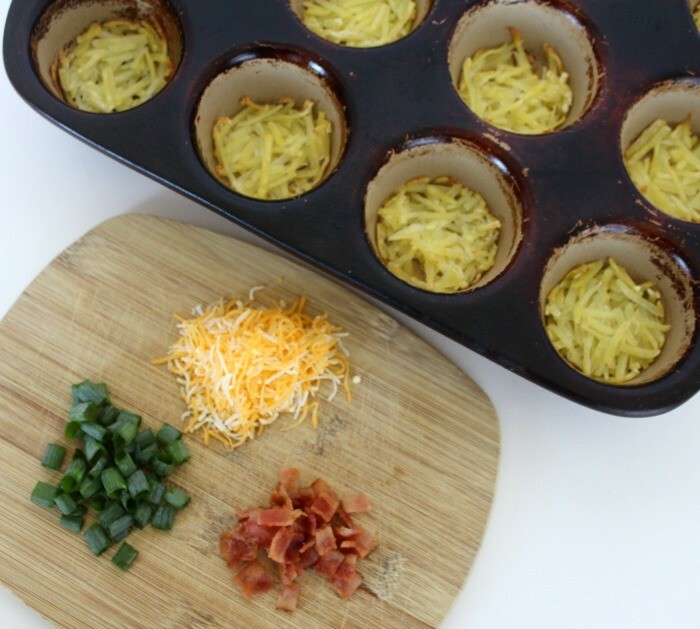 While these are baking, prepare your other ingredients – which are bacon, green onions, grated cheese and eggs. After the hash browns are done, sprinkle on your chopped bacon and green onions. Then pour over your scrambled egg mixture and top with cheese. Voila! They’re ready for the oven. Bake for another 15 to 20 minutes at 350 degrees (down from the previous 400 degrees for the hash browns), until the egg is set. Let them sit for 5 minutes and then slide a knife all around the edges of the muffin to loosen. Serve with fruit and a glass of orange juice or coffee and you have one hearty, delicious breakfast. You can refrigerate or freeze these and just warm up in the microwave to eat. It’s good to make up a couple of batches to have on hand throughout the week. These would even make the perfect light dinner. Here’s the recipe! 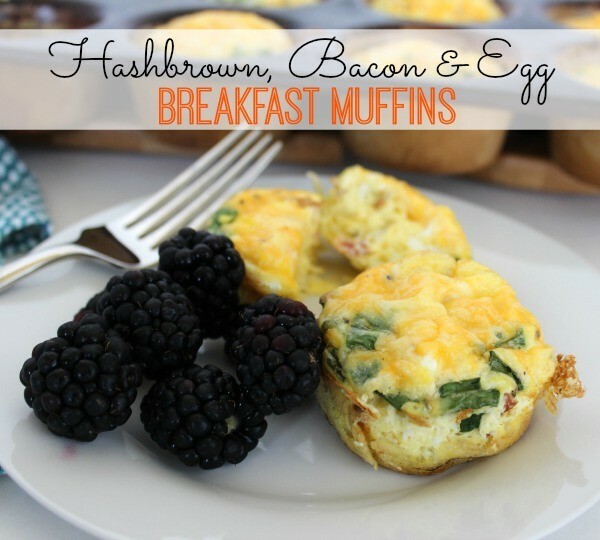 A hearty breakfast muffin that will stick with you until lunch. It's like a loaded baked potato in muffin form. Yum. 1. Spray a muffin tin with cooking spray. 2. 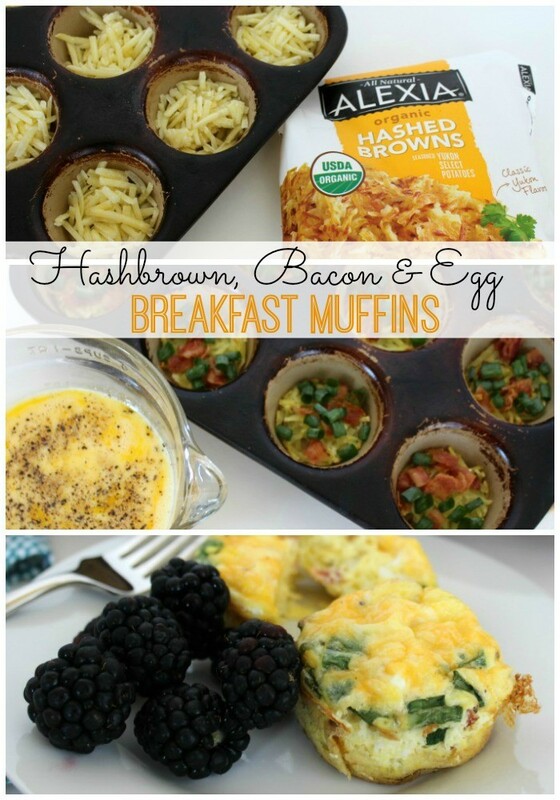 Put a small layer of hash browns on the bottom of the muffin tin. Lightly spray the top of the hash browns with vegetable spray or lightly brush with vegetable oil. 3. Cook in a 400 degree oven for 20 minutes. 4. While the hash browns are cooking, prepare your filling ingredients. Cook and chop up the bacon. Chop up the green onions. Beat the milk and eggs together. Grate the cheese. Sprinkle in a little salt and pepper in the eggs. 5. After the hash browns are done, sprinkle on top the bacon and green onions. Pour the egg mixture evenly into the cups. Lastly, sprinkle the grated cheese on top. 6. Bake in a 350 degree oven for 15 minutes, or until the egg is set. 7. Serve with fresh fruit. Next articleFile Your Taxes Free and Online with TaxAct – Deadline Approaching!